Queso, anyone? With tortillas outselling hamburger and hot dog buns while salsa dethrones ketchup, Mexican food is more popular than ever in the United States — and cheeses are a key component of America’s favorite Mexican dishes. But are all cheeses created equally? Queso is not just that ubiquitous, neon cheese sauce you might sometimes see in the grocery store. In Spanish, the word simply means cheese, and Hispanic cheeses rival anything else you might see in the supermarket aisles, with a wide range of flavor profiles to tempt any palate. Cacique, the number one brand of Hispanic cheeses, chorizos and cremas, wants to give quesos like Queso Fresco, Panela, Oaxaca and Cotija their day in the sun. Just like Mexican cuisine, Hispanic cheeses have great crossover appeal. James Beard-winning restaurateur, MasterChef judge and proud Mexican-American Chef Aarón Sánchez agrees. "American cooks may not be as familiar with Hispanic cheeses as they are with others at the grocery store," Sánchez says. "The names might come across as intimidating, and they may not be sure of how to incorporate these cheeses into their cooking routine. But there's really no mystery. Hispanic cheeses can be used for a wide range of dishes in your everyday routine, and not just Mexican classics." Here's a primer in Queso 101. Queso Fresco, one of the most widely used cheeses in Mexican cooking, is a soft, fresh cheese similar in flavor and texture to ricotta, but with more savory, milky notes. Mexican cooks use it to top or stuff dishes like tacos, empanadas and enchiladas. But you don't need to limit it to Mexican cuisine. Crumble it on hot dogs, sprinkle it on soups and chowders, or make a Mexi-grilled cheese with queso fresco and green chiles. Panela has a mild and creamy flavor, and is a crumbly, curd-style basket cheese — similar to a cross between paneer and halloumi, but less salty. This cheese is great for baking, grilling or frying. Fry a slice of panela cheese in a pan to achieve a perfectly seared snack with a gooey, delicious inside. Or, make a baked dip! Cover the cheese with roasted salsa, then bake it in a 375-degree oven for 20 minutes. Enjoy with chips or bread. Cotija, named after the town where it originated, is like Parmesan and dry feta but creamier, with a savory flavor and crumbly texture. Use it just like you'd use Parmesan. Crumble it on salads, top pasta dishes with it, or even substitute Cotija for Parm in Fettuccine Alfredo, adding a dash of chili powder or chipotle for a little Mexican-inspired zing. Oaxaca has a mellow, earthy flavor and buttery texture, similar to mozzarella, with a superior melt. Use it just like you'd use its Italian cousin, including pizza, lasagna, melting on sandwiches or snacking. Manchego has a nutty, earthy flavor and creamy texture. Similar to Colby in tanginess and cheddar in aroma, Manchego will be the star of your cheese board. Or bake it into a frittata, shred it for mac and cheese, or use it anywhere you'd use cheddar. Eager to try some of these cheeses? Cacique's website has a store locator. Type in your zip code and you'll find a store near you that carries them. And then you'll be on your way to adding the flavors of Mexico to tonight's dinner. 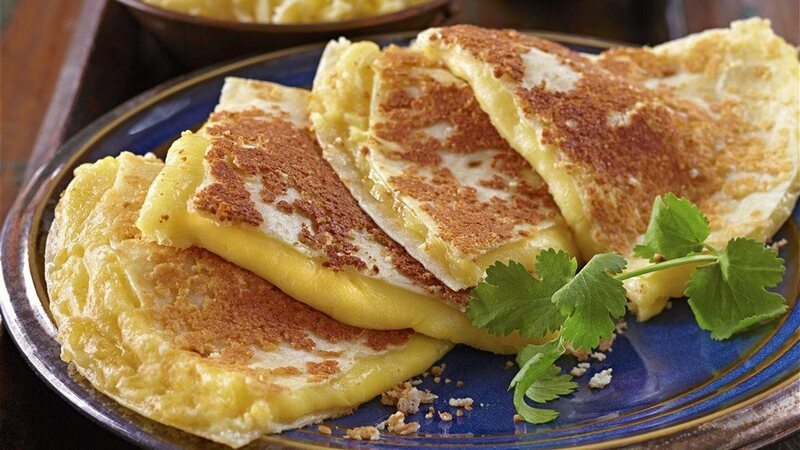 And if you’re looking for a place to start, check out this delicious Cotija Crusted Quesadilla recipe. 1. First spray a skillet with non-stick spray, then sprinkle 1 tablespoon of crumbled Cotija evenly around the skillet and cover with a tortilla. 2. Next, sprinkle 1/2 cup of shredded Cacique® Queso Quesadilla over the top of the tortilla and cover with a second tortilla. Press down and let this brown for 1 minute. 3. With a spatula, lift up the entire quesadilla and sprinkle remaining Cotija evenly around the skillet. Then flip and let the other side brown for 30 seconds. Cut quesadilla into four wedges, plate it and add whatever garnish you’d like. Cheeses from Mexico rival anything the French can dish out, offering a wide range of tasty, savory, nutty, even sweet cheeses to tempt any palate. They're just not as well known as their French cousins. Queso Fresco is a soft, fresh cheese similar to ricotta, but with more savory, salty and tangy notes. Use it with tacos and enchiladas. Panela has a mild, creamy, slightly tangy flavor, with a texture that is a cross between feta and ricotta. This cheese is great for baking, grilling or frying. Cotija is like Parmesan but creamier, with a savory flavor and crumbly texture. Use it just like you'd use Parmesan. Manchego has a nutty, earthy flavor and thick, creamy texture. Similar to sharp English cheddar. Oaxaca has a mellow, earthy flavor and buttery texture, similar to mozzarella with a superior melt.